In the UK 1 in 13 live below the poverty line, in Newport the figures are a little higher with many households affected by benefit changes and low incomes. Food poverty has become an increasing problem and charitable organisations are filling the void left by the welfare states. Two organisations - Trussell Trust and King's Church - deliver much of the support in Newport. The Trussell Trust is a Christian charity that does not affiliate itself with any political party and receives no government funding. They say "We are non-judgemental and inclusive, providing assistance to people of all backgrounds and all faiths or none who are found to be in genuine need." The four Trussell Trust distribution centres are based at St Paul’s and Bishpool Methodist Church, Duffryn Community Centre and the Christchurch Centre in Malpas Road. Those in crisis have to be referred from to them by doctors, health visitors, job centre, social workers, Citizens Advice Bureaux and police. Non-perishable food is donated by members of the public at collection points or through schools, churches and businesses. Those identified as needing help are issued with a food bank voucher for three days worth of food. The Trussell Trust estimates more than 65% of users were only helped once over a six-month period, and only 7.5% needed four or more vouchers. Volunteers can also direct people to agencies to help them solve longer-term problems. The use of foodbanks in Wales is disproportionately high in relation to the population, a report by Oxfam revealed in June. 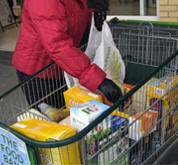 Below the Breadline found the foodbank charity Trussell Trust had dealt with 79,000 people in Wales last year compared to 71,000 in Scotland, whose population is two-thirds bigger. Oxfam Cymru said Wales was caught in a "perfect storm" of "benefit cuts, low wages, sanctions and insecure jobs". Many recipients are affected by the cuts in Housing Benefit including the bedroom tax or sanctions applied to social security benefits. The King's Church in Newport operates a food support scheme. Jesus Cares started in 2009 as a result of community organisations contacting the King's Church to ask for food for families they were working with, who had no money to feed their children. They say "We have seen that there is a real need for the practical help that Jesus Cares can provide to families and individuals within our communities, as many organisations do not have money within their budgets to purchase food and other essential provisions for people who are struggling. Jesus Cares has rapidly grown since it’s inception. We started out delivering 50 food hampers per month, we now give in excess of 1200 per month, and this figure is set to grow even further with the extra funding we’ve received from the Big Lottery Fund." Their Christmas hampers were supported by Hasbro, the toy company and the Celtic Manor.